Here’s a film that makes for a good companion piece to last year’s “Bridge of Spies” and its lead actor even had a role in that Steven Spielberg Cold War legal thriller. 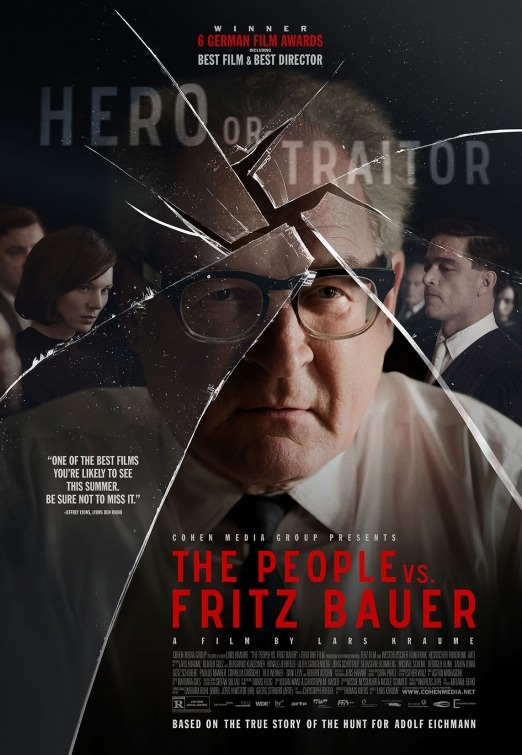 Like that film, “The People vs Fritz Bauer” takes place predominately in post-WWII Germany and it also revolves around actual events in history, albeit little known events to most people. 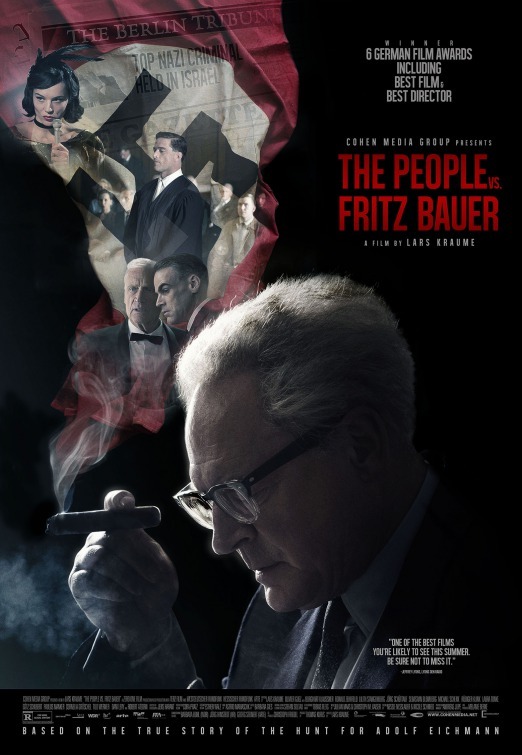 Directed and co-written by Lars Kraume, this political procedural did to me what Spielberg’s film wound up doing – it takes a period in history I knew very little about and through fine performances from a solid cast, sharp art direction and confident directing – left me revised and fascinated and more interested in this period in history than I ever thought I’d be. It feels like the kind of clever/intellectual thriller that’s rarely made, maybe because it is thankfully missing an action sequence or explosion. The setting is Frankfort in the late 1950s and as the film starts we meet Fritz Bauer (Burghart Klaußner), a cantankerous and obsessive Attorney General for the German government. He reports to Governor Zinn (Götz Schubert) and under him are five younger state attorneys, of which only Karl Angermann (Ronald Zehrfeld) is a conscientious and trustworthy fellow. There have been attempts on Bauer’s life lately, because he and his office are pursuing German war criminals during a time when the country isn’t quite ready to face the music of their recent actions during the war. Of particular interest to Bauer is apprehending a former high-ranking SS officer, Adolf Eichmann (Michael Schenk) – who was responsible for transporting millions of Jews all over Europe to concentration camps during – and putting him on trial in Germany. 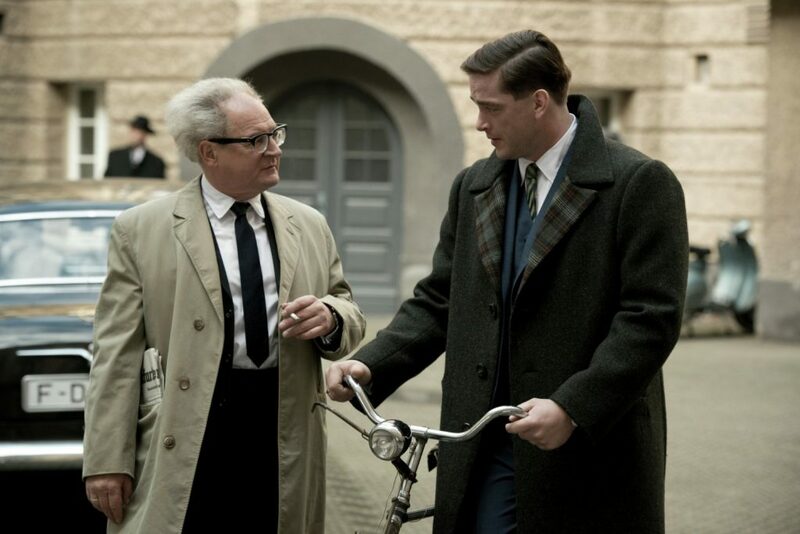 One day, Bauer gets an anonymous letter from a man named Lothar Hermann (Christopher Buchholz) in Buenos Aires, Argentina, who believes Eichmann is living there under an alias and is concerned that his daughter has fallen in love with Eichmann’s eldest son, Nick. One would think such a tip-off would prove invaluable, but there is a sense that taking such evidence to Interpol or local Intelligence will alert Eichmann. Since the Federal Intelligence Service (otherwise known as “Bundesnachrichtendienst” or BND) won’t look into it, Bauer persuades Angermann to verify a secondary source that the architect of the Holocaust indeed resides in Buenos Aires. Such evidence would guarantee the involvement of the Mossad (Israel’s intelligence agency), a route Bauer is forced to take despite the threat of treason. As Bauer’s obsession increases, so to does his working relationship with and mutual appreciation for Angermann, who encounters his own personal challenges which could jeopardize the investigation. As the title suggests, virtually everyone is against Bauer’s efforts to bring this war criminal to justice. What’s most interesting is why and Kraume and co-writer, Oliver Guez, keep the numerous answers to such a question somewhat vague, which only adds to the layered mystery. Suffocated by bureaucratic red tape and opposition from right-wing authorities at seemingly every turn, the dedication and determination of the gruff, chain-smoking Bauer is challenged throughout the film. Yet he remains as resilient a character as George Smiley from “Tinker Tailor Soldier Spy”, only Bauer was a real person despite his very cinematic presence. The fascinating character is brought to life by Klaußner (he played the pastor in Michael Haneke’s haunting “The White Ribbon”), who delivers absolutely splendid work here. The actor loses himself in the role of a closeted gay, German-born Jew whose legal career was interrupted when he was sent to a concentration camp in the 30s and later returned only to be labeled “a vengeful Jew” by his peers. I know nothing of the actual Bauer, but I couldn’t get enough of Klaußner’s work, with his distinct body language, wiry gray hair and squinty expressions. Klaußner portrays the socially awkward character like a German Columbo – always in a suit, sometimes wearing a trench coat – in his gravel-voiced, nose-to-the-grindstone demeanor. Kraume inhabits the film with many great Bauer scenes that add dimensions to the curmudgeonly character. One in particular involves Bauer appearing on “Cellar” a local TV program where young Germans sit in a makeshift beatnik cafe and discuss current events with a each week’s guest. His answer to the question, “What should Germans be proud of?” is a challenging one, but he answers with such unexpected simplicity and vulnerability, that it earns him equally unexpected (and unwanted by Bauer) support. It’s one of a handful of scenes that reveal the humanity under his rough persona. 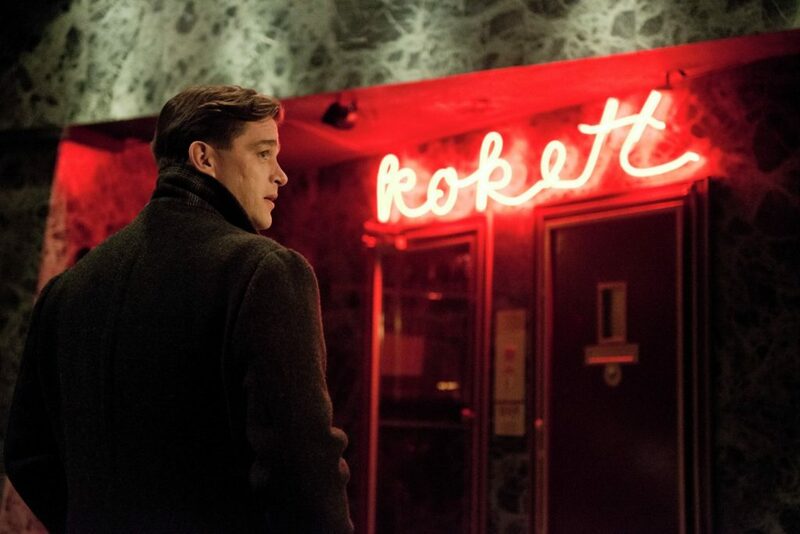 Much of that gradual revelation has to do with his mentoring friendship he develops with Zehrfeld’s (so good in Christian Petzold’s “Barbara” and “Phoenix”) newly married Karl Angermann, who struggles with the same frowned-upon temptations as Bauer. He’s patient with Bauer, looking up to him when everyone else seems dismissive and in turn Bauer possibly sees a younger version of himself he’d like to help out. Angermann may not be based on a real-life character, but his subplot involving a forbidden trist with a transgender singer, Victoria (an alluring Lilith Stangenberg), in a gay nightclub, delivers the films most emotional gut punch. Ordinarily, such a subplot for a supporting character would seem distracting or unnecessary, but it turns out Angermann’s story is needed as both a gateway character to Bauer as well as a way to ground the story emotionally. Plus, the chemistry between Klaußner and Zehrfeld becomes more satisfying to watch as the story unfolds. The are two men who understand and care for each other in a way that is rarely seen on-screen, especially in a story in this time period. 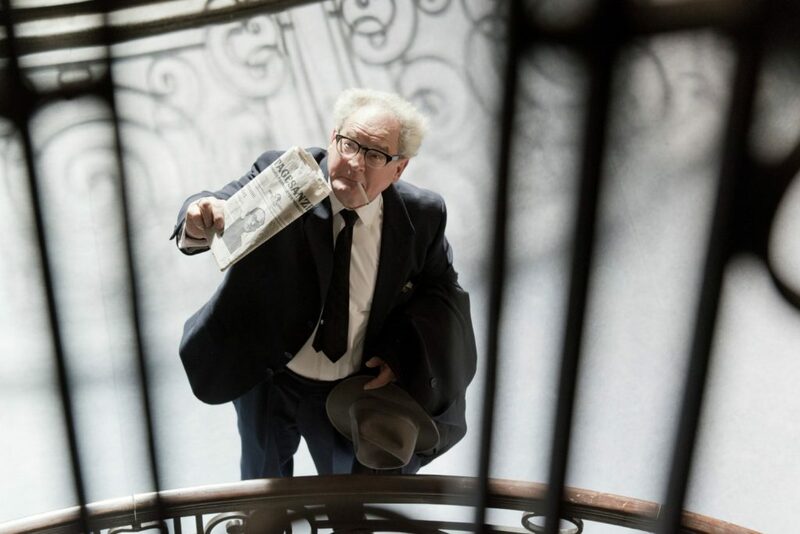 “The People vs. Fritz Bauer” was one of Germany’s submission for the Best Foreign Language Film category at this year’s Oscars, but was not selected. I guess I can see why. It’s a dialogue-heavy, performance-driven period film that some may consider slow and drawn-out. Not me. I found it to be an unexpectedly compelling look at a man who single-handedly took on the daunting task of attempting to turn the tone and mentality of his fellow countrymen. With Klaußner’s help, Kraume admirably created a captivating character study amid a complicated and pivotal time in German history. That’s one of many reasons to see this film.